What if electronics emerged from knitting, weaving, crochet, and embroidery? Stitching Worlds blends the territories of textiles and electronics by investigating textile techniques as controversial means for manufacturing electronic objects. Bringing together the results of a four-year arts-based research project, the book challenges our assumptions and expectations about technology by revealing unexpected potentials of often-undervalued knowledge and skills. 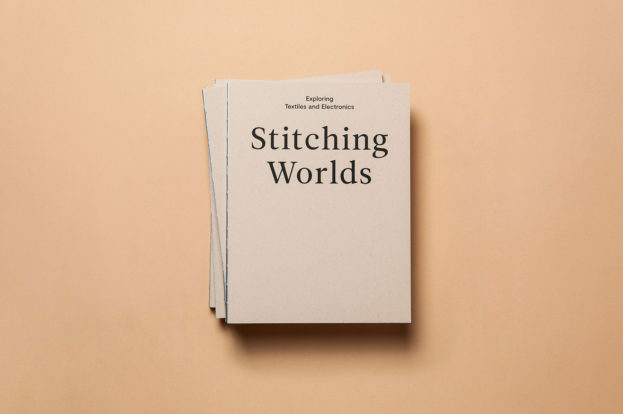 This book results from the arts-based research project Stitching Worlds carried out between May 2014 and June 2018 at the Department of Industrial Design 2, University of Applied Arts Vienna, and is published in conjunction with the exhibition titled Stitching Worlds, on view at the Angewandte Innovation Laboratory (AIL), Vienna from April 9 through April 27, 2018. Funded by the Austrian Science Fund (FWF): AR 284-G21 in the Programme for Arts-based Research (PEEK). The publication also was kindly supported by Europapier. The book can be purchased from Revolver Publishing.